One of the great things about taking my meteorites course this term is that I’m learning a lot about the different aspects of meteorite studies and how it all ties into what we know about the origin of the solar system. It’s also giving me the opportunity to revisit previous Meteorite Monday posts and flesh out some concepts that were, at that time, beyond my comprehension. 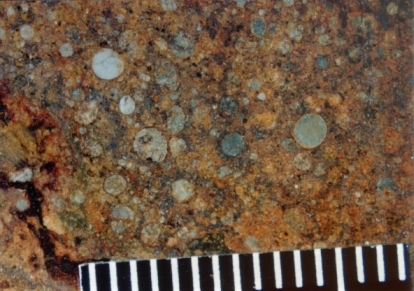 One of the more well-studied aspects of meteorite research is the chondrule. These are one of the most telling aspects of a meteorite. In the simplest of terms, they are silicate spheres that are usually less than 1 mm in diameter and are found embedded in most ordinary chondrites. For the purpose of this post I’m not going to get into chondrule formation as it’s a fairly involving topic and is deserving of more time than what I can give it. The important thing to know is that they’re considered some of the oldest material in the solar system. Isotopic dating tells us that they formed within the first 2 to 3 million years of the birth of the solar system. They were little molten droplets that were formed in the solar nebula and were heated to about 1900 C and then experienced rapid cooling. This high heat and quick cooling determined their texture and over all chemical components. They’re generally composed of either olivine or pyroxene and sometimes both minerals occur in the same chondrule. These minerals can display some really beautiful textures. This is a picture of a chondrule with a barred olivine texture. The olivine crystals are the elongated structures and they’re set in a glassy matrix or body. I highly recommend clicking through the link as NAU has some spectacular pictures of other chondrule types and how they form. This next image is of a chondrule displaying a porphyritic texture. This is a way of describing a course grained chondrule where the olivine crystals are enclosed in pyroxene crystals. 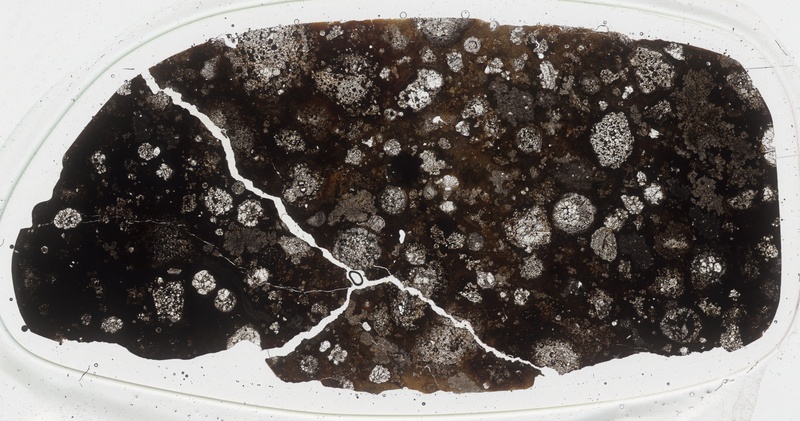 And this is one of my favorite chondrule images. These are two chondrules that collided while still molten in the solar nebula and fused together in a quick cooling process. These two chondrules display a microcrystaline texture. 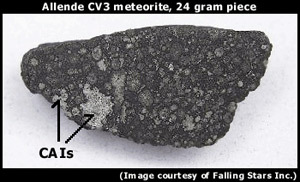 (Image from Meteorite Pages. Click through for the link to the source page). 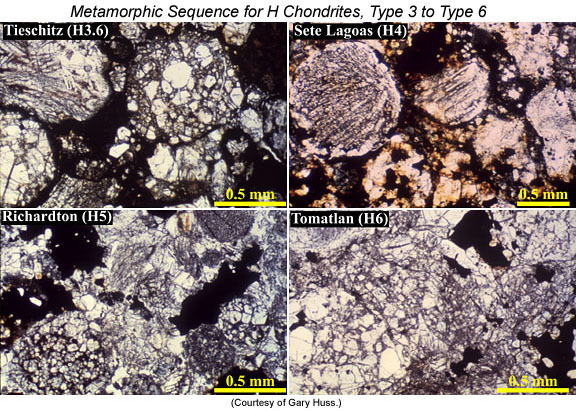 As I said earlier, there is a lot more behind chondrules and their formation that I can’t get into yet. At some point in the near future I plan on putting together a post that deals with what chondrules tell us about the early years of our solar system.